TOKYO (TR) – Daisuke Matsuzaka is 26 and sports a crown of spiky hair. He stands at 182 centimeters, weighs 85 kilograms, and throws a gyroball. Based largely on Matsuzaka’s dominant performances in the World Baseball Classic and the 2.13 ERA and 200 strikeouts he posted with the Seibu Lions last season, last month the Boston Red Sox submitted a bid for the whopping sum of six billion yen just for the privilege of negotiating a contract with him. “It is a pitch with a gyro spin,” explains Dr. Ryutaro Himeno, the director of the Advanced Center for Computing and Communication at the science and technology research institution Riken in Saitama Prefecture. Himeno, in a brown blazer and ruffled hair, says that the pitch is delivered such that its release from the fingers sends it toward home in a tight spiral, much like a fired bullet. He uses the “football pass” analogy to explain the proper means for unleashing a gyroball. In the late ’90s, Himeno started simulating how a gyroball moves on a computer. In 2001, he co-authored the book Makyu no Shotai (The Truth about the Supernatural Pitch) with baseball instructor Kazushi Tezuka. Matsuzaka, however, complicates things by being secretive in public about whether the pitch is really part of his arsenal, saying that he maybe experiments with it on occasion or that he doesn’t throw it at all. His coyness has spawned rumors and guesses on the traits of the pitch. American newspapers, whose stories typically compare the pitch’s elusiveness to that of a ghost or the Loch Ness Monster, have approximated the degree of the pitch’s break, graphically showing it making a sweeping turn as it crosses the plate – a movement so large that it exceeds even that of a curveball. Others have suggested that it slices back in the opposite direction. Is this beast for real? Conversations with the pitch’s pioneers, two very different people working in two very different worlds, make reaching some kind of concurrence on the gyroball’s characteristics and Matsuzaka’s connection about as easy as trying to hit a Matsuzaka pitch – any one of them. In Himeno’s office, the professor has a plastic bottle that has had both of its ends trimmed. With red tape lining its edges, the former vessel is now a gyroball training tool in the shape of a cylinder. After explaining that a proper gyro grip is the same as that of a standard fastball, Himeno, takes the bottle up into his hand as if he were to throw a pass. He follows through, rolling the tube to the tips of his fingers and bringing his hand down in front of himself almost like a karate chop. From hand to home, two forces work against the ball: a drag force (caused by friction) retards the velocity and gravity brings it back to earth. A pitch changes its direction because of its rotation. The curve, for example, is delivered with topspin, which for a right-handed pitcher pushes the ball down and to the left. Likewise, the backspin on a fastball gives it a slight push upward to fight gravity (though not enough to cause it to actually rise). 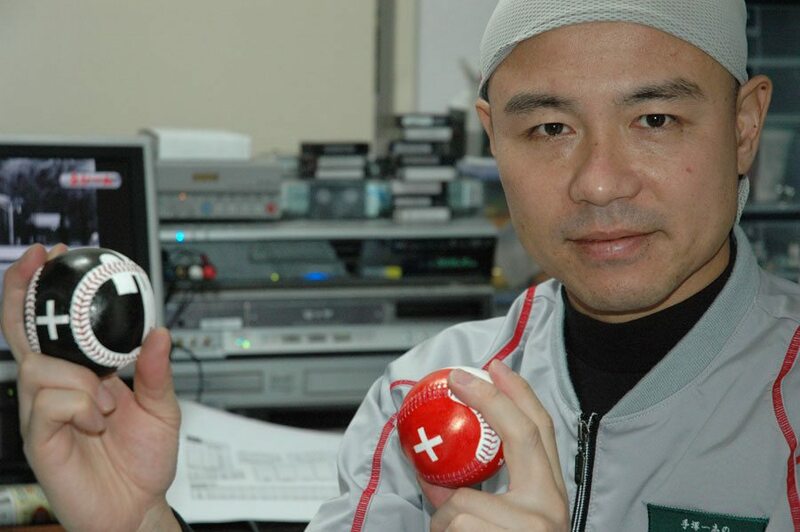 Himeno says that for a properly thrown gyroball the direction of the ball’s rotation will be exactly perpendicular to the direction of travel. Since these two velocity vectors do not intersect, which is not the case for a curveball or fastball, there will be no additional push influencing the ball in any direction. Mother Nature then says that upon its release the gyroball will be slowed by friction and felled by gravity only. There will be no curving, cutting, slicing, or dicing. Just drag and drop. Himeno got his start in modeling baseball movements with the forkball, a pitch that takes a sudden dive after it crosses the plate. The forkball is thrown with very little backspin. As a result, the slight upward push given to the fastball is not there. The forkball will approach the plate looking like a heater but its little rotation causes gravity to send it sinking. In 1996, while working for Nissan Motor Co., Himeno studied the wake pattern formed as air flows over the seams of a rotating forkball as a hobby. This wake creates drag and impacts the direction of the ball. Studying such phenomena is crucial in the aviation and automotive industries. For example, air moving over the surface of an airplane wing produces the lift that allows a plane to fly. Himeno, whose usual line of study involves analyzing fluid flows and assembling supercomputers, subsequently switched his hobby to the gyroball a few years later, following his departure from Nissan. It was during this time that he was invited by Dr. Koichi Omura at Takarazuka Zokei Geijutsu University to participate in roundtable research discussions, where twice a month students, teachers, researchers, and athletes discussed various scientific topics. It was at one of these meetings that baseball instructor Kazushi Tezuka proposed studying a baseball that rotates like a spiral. The results showed that the wake behind the two-seam version had a wide path, very similar to the forkball. But the air flowing over the four-seam gyroball followed the curve of the ball much more, making its wake narrow. Himeno’s conclusion: the two-seam gyroball drops like a forkball; the four-seam gyroball drops, too, but less; both variations generate much less drag than a forkball, causing them to arrive to the plate faster. Some of his findings were sent to Tezuka, who published them in his 1998 book Picchingu no Shotai (The Truth about Pitching), an instruction guide filled with descriptive cartoons that covers everything from achieving a proper release to how bones and muscles work together during a pitcher’s delivery. Dr. Robert K. Adair, a physics professor at Yale University, who authored the book The Physics of Baseball, the Bible on the study of a baseball’s behavior after it has been hit or pitched, is skeptical about the efficacy of throwing what amounts to being a fast forkball. As if to explain, Himeno has set up one of his computers in a five-row theater on his building’s first floor. On the screen emerges a computer graphic of a large baseball. As it rotates as a two-seam pitch, dozens of colored streams of dots (simulating the air flow) dangle behind it. After sporting a pair of 3-D glasses, theatergoers can see the gyroball spin as its trailing flow lines seemingly dangle out over the floor like a mutant octopus has attacked a Lite-Brite board. Himeno has studied three variations of the gyroball. In addition to the basic version, another option involves rotating the pitching hand horizontally in a clockwise manner. This shift, Himeno says, creates a little backspin. Dubbed the “gyroball with lift force” by Himeno, this pitch nearly follows the path of a fastball, dropping much less than a pure gyroball. The final variation is the only version that breaks laterally. The gyroball “with side force” occurs when the pitcher upturns his hand slightly to apply sidespin. In the basement of a small building off a major expressway in Tokyo’s Setagaya Ward is the dojo, or training hall, of Beta Endorphin, a company that provides sports instruction to youngsters. Green artificial turf fills the space between two pitching mounds and two home plates. As a coach stands at the edge of the left mound, pitch after pitch from a young left-hander snaps into the netting behind the plate. In a brimless gray hat and workout jacket Kazushi Tezuka, the president of Beta Endorphin, watches through the gaps in the green netting. As described in The Truth about the Supernatural Pitch, of which plenty of copies are available at the clinic’s register, the circular rotation of the hips off the pitcher’s back leg provides the initial torque that comprises the first spin in the “double spin” technique. The spinning of the ball off the fingers, as described by Himeno, is the other spin. Getting the two spins to work in tandem is the basis of mastering the gyroball, says Tezuka. Man-to-man instruction to hone this technique requires 12,600 yen per hour. Including all of his classes, Tezuka logs approximately 200 hours of training in both Tokyo and Osaka. Beta also offers special day-long group classes on occasion for 8,400 yen. Ads for these classes in magazines feature a bald and naked, butoh dancer-like caricature going through the motions of delivering a gyroball. Through the Beta Web page, gyroball training kits are available for 4,200 yen. The package contains a pair of half-painted balls, one each for the two-seam (red) and four-seam (black) throws. Markings show the placement of the fingers. A cross (+) designation positioned at the “front” of the ball allows the receiver of the pitch to judge whether a tight spiral has been achieved by the pitcher – in other words, the appearance of something similar to a spinning drill. As speculation grew over the past season about whether Matsuzaka would indeed make the jump to the big leagues, the story of the gyroball slowly slipped its way across the Pacific and into baseball circles as yet another Japanese wonder, like the 15,000-yen melon or the love hotel. Each Matsuzaka gem conjured up yet more Godzilla-like, mythic creature imagery than the one before. Perhaps some gyroball hype is justified; in baseball’s century and a half in existence few pitches have simply emerged. Following arm surgery in the early ’70s, right-hander Bruce Sutter abandoned his fastball and relied on the drop of the split-fingered fastball (a faster version of a forkball) to become one of baseball’s greatest closers with the St. Louis Cardinals. The pitch, which to that point had not been widely used, eventually landed him in the Hall of Fame. Fernando Valenzuela did not invent the screwball but he did drag it off the scrap heap in 1981, the year the chubby left-hander won the National League Rookie of the Year and Cy Young awards for the Los Angeles Dodgers. Matsuzaka is different. He doesn’t need a gadget pitch; he dominates with his entire repertoire, with many experts saying that his change-up is his most devastating pitch. As an 18-year-old in 1999, he won 16 games and took the Pacific League’s Rookie of the Year crown. In his career, he has piled up 108 wins against 60 losses while boasting an ERA of 2.95. Back at the theater at Riken, Himeno has grabbed a plastic bat that has had two sensors attached at both ends of its hitting zone. A small device in the floor that emits a magnetic field is acting as home plate. Both pieces of equipment are hooked up to Himeno’s computer. Boston manager Terry Francona, who has studied Matsuzaka on video, is quoted as postulating the gyroball to be a screwball (the opposite of a curveball) that acts as a change-up. After hearing of such a comparison, Himeno shakes his head. “The gyroball,” he says, “is much faster than a change-up.” He approximates that Matsuzaka’s two-seam gyroball reaches the plate at around 140 kph. Himeno taps a few keys and a computer rendition of a baseball stadium (from the hitter’s perspective) appears in place of the rotating baseball from before. A cartoon pitcher stands on the mound. He winds and a pitch tumbles out of his hand. Himeno, who describes himself as a scientist with only a passing interest in baseball, takes his best hack. There is contact. The computer then dishes out three pitches simultaneously: a fastball, a forkball, and a gyroball. Dashed lines of different colors stream from behind the advancing balls to represent the different trajectories. The model shows the gyroball to nearly follow the path of the forkball. The fastball’s line is left suspended far above the other two. “Tezuka claims that sometimes the gyroball has ‘hops,'” Himeno says, shrugging his shoulders. Tezuka’s tiny, cramped office is on the fourth floor of the Beta Endorphin building. DVDs and VHS tapes fill the shelf in front of his desk. Next to his chair is a computer monitor. The birth of the gyroball can be traced back to 1995. Tezuka was observing some students playing catch. One of them was throwing particularly hard. After watching the delivery of his pitches, Tezuka knew something special was taking place. The benefit of the four-seam gyroball, Tezuka says, is its surprising explosiveness. Batters, he believes, are lulled into thinking a typical fastball is approaching only to find it already streaking through the zone as they start their cut. But most gyroballers, he says, throw the two-seam version because of its extreme movement. On his computer he brings up videos of high school players throwing gyroball training balls. The slow-motion footage, which was shot with a camera set directly behind home plate, shows the plus mark (+) on the ball to be generally visible and slightly weaving as it approaches home. Tezuka then switches to highlights of Shunsuke Watanabe, a starting pitcher for the Chiba Lotte Marines, one of four pitchers in Japanese professional baseball who has pitched the gyroball in the last few years, according to Tezuka. In his 5,000-yen instruction DVD Jairoboru no Nagekata (The Way to Pitch the Gyroball), Tezuka emphasizes the importance of lowering the throwing shoulder. Watanabe is a sidewinding, two-seam gyroballer. He drops down with his arm so far that he almost scrapes the dirt on top of the mound. His gyroball then is delivered with his fingers roughly parallel to the ground. Batter after batter can be seen flailing at Watanabe’s high hard stuff. None of his pitches, however, are seen dropping like a forkball, as predicted by Himeno. When asked about the difference between his computer results and Tezuka’s observations in the field, Himeno didn’t have a clear answer. He supposed though that in a practical sense pitchers are more apt to throw the gyroball variation where the lift force causes the pitch to drop less. Tezuka’s theory, however, is that if a pitcher releases the ball from as low as possible it will not sink as it crosses the plate. Tezuka changes the monitor to show highlights of Sandy Alomar Jr. and Barry Bonds facing the now retired Tetsuro Kawajiri of the Hanshin Tigers, another two-seam gyroball pitcher (or so says Tezuka). The footage is from the 2000 MLB All-Star tour of Japan. The sidearmer fires multiple pitches into the strike zone. Alomar is seen to ground out weakly to shortstop. Bonds pops out to center. Each hitter’s swing seems to have been slightly off balance. Tezuka grabs a paper cup, gripping it around the rim and pointing it in front of himself. He then quickly shifts it up, down, and side to side as if to mimic a moving ball. In The Truth about the Supernatural Pitch, close-up frame captures of a television broadcast showing Kawajiri’s release are reproduced. Given the low quality of the images, however, it is not clear how the rotation achieved is different from a regular two-seam fastball. All four of the gyroball specialists Tezuka named – with Tomohiro Umetsu of the Hiroshima Carp and Tomoki Hoshino of the Seibu Lions being the others – are sidearmers. In fact, Tezuka says that a gyroball can only be pitched sidearm style – it is impossible to throw any other way. So where then does that place the most famous gyroballer of them all, the young phenom who throws overhand? To this point in the saga, a Matsuzaka link to the gyroball is a tough one to make: neither Tezuka nor Himeno had met Matsuzaka; as well, the pitch had only existed on Himeno’s hard drive and in Tezuka’s teachings. Tezuka claims that the Matsuzaka-gyroball connection is rooted in a program that ran on public broadcaster NHK on August 27, 1999. The year before Matsuzaka had reached legendary status. In leading Yokohama High School to victory in the Koshien Summer High School Baseball Tournament, he tossed a no-hitter in the final and gutted out a 17-inning, 250-pitch performance just days before. 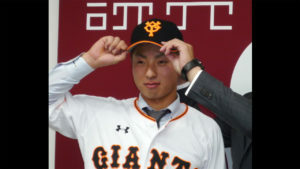 Titled “18-Year-Old Daisuke Matsuzaka: The Super Rookie’s Spirit and Technique,” the 50-minute show attempted to explain the reasons for his success. Tezuka and Himeno were asked to participate. The rotation of Matsuzaka’s pitches was a key topic. One segment featured a fuzzy frame-by-frame sequence of a Matsuzaka pitch that purportedly displayed a jairokaiten, or gyro rotation. Still, is it possible for a young pitcher to be throwing a new pitch that a team of researchers just happen to be developing with neither of the parties having spoken to the other? Reading through The Truth about the Supernatural Pitch reveals that there is very little content that represents Himeno’s concepts on how to throw the gyroball. Chapter 3, which provides a background in physics and Himeno’s graphics, is the only portion credited to him. It is very much Tezuka’s book: from his thoughts on the deceptive speed of the pitch to the underhand delivery. Likewise, Himeno’s The Making of the Supernatural Pitch presents his side of the gyroball coin. Tezuka is very happy with his schools. The gyroball is his baby. At a minimum, pitching sidearm fastballs is certainly not unprecedented. Kent Tekulve and Dan Quisenberry did very well in the big leagues dropping down submarine style. By 2012, Himeno expects to have constructed the world’s fastest supercomputer at Riken. 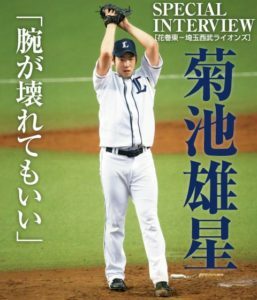 In speaking engagements and interviews (like the one for this article), he still maintains that Matsuzaka’s slider is in fact a two-seam gyroball. Two weeks ago Matsuzaka signed a 6-year, 6.1 billion-yen deal with the Red Sox. He will make his debut next spring. No doubt, Himeno and Tezuka will be watching right along with everyone else. Note: This article originally appeared in December 2006 on the Sake-Drenched Postcards Web page.